Yeah this will be indefinitely paused because maps. Lame. I didn't even get a chance to play. Weirdly, I kinda expected this to happen. Anything I join gets cancelled two weeks later. Anyone else want to run it or are we finished here? So is this game discontinued? Its hiatus. I will likely have it post my birthday. Don't worry. Edit: Its because I have to place both the other continents, create NPC nations around Crazen, and then I have to create random events. Lots of work. This next week I will be home nonstop, so I should have it done. It won't have a arrival time. EDIT2: Ok I have the map made. Events for various people will be done hopefully Sunday. I'll have the rest done hopefully by next Wednesday. I know you already created different areas (one of which I was going to occupy), but if you think it would be easier to keep things consolidated around one specific area, that would be fine. The main area (Plank, Hydro, Marty, and Ovi) seems a little sparse anyway and could do with a few more nations. It's up to you though Badger. Well I realize I should have let more players into the original group. But it's late for that. I'll have everything ready soon so I can write the update. We should all totally change our decisions at the last second. That is a horrible idea, imagine if real-life leaders did that. Doesn't work well. Ok, I'll be having the update tomorrow, just finished all the maps. However, I'd like it if, in future instances, you (everyone) could be as specific with the research as possible, otherwise it'll just be you following progression as the real world. And that's rarely fun. Rather than say to progress, you say things to try with it, and I'll work from there. Otherwise you'll all have perfected the musket but never reached the rifle. So instead of saying "Research Farming", you'd say "Research artificial fertilizers" or something? Tensions rise between the Bernogratzer and Westcutogoan people, however both continue to trade with Wasgo, albeit with armed merchant ships. Rumour has it that man-eating turtles live far to the south. Other rumours state that sharks the size of whales live to the north. Another claims that the nation of Losar is occupied by werewolves, and the people of Wasgo ride unicorns. And yet more claim the existence of a gargantuan empire far to the east, powered by the will of a bloodthirsty demon. 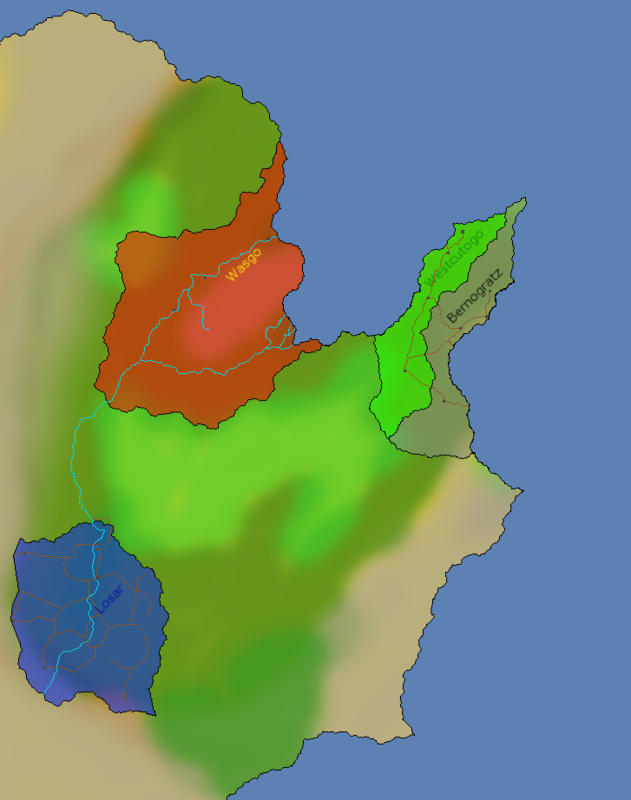 The nation of Wasgo has grown greatly over the last season, expanding to take the entire North-Eastern half of the river. Losar has become almost shining in the night, and from the mountains of Wasgo it can be seen glittering in the moonlight. A reminder to all involved, in three days I will be doing the next update.